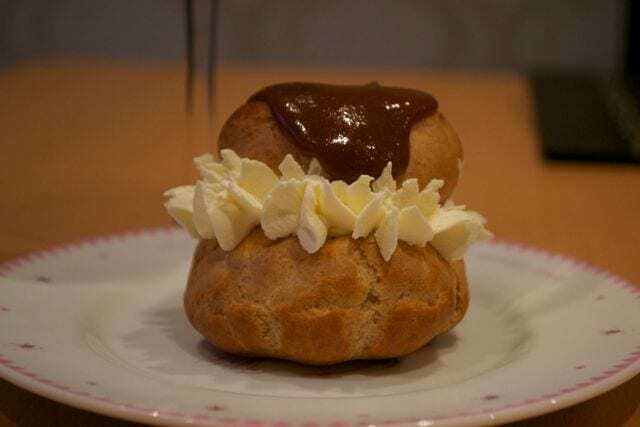 The week I’ve been waiting for – Choux Pastry week! I will never get over the wonder of watching choux pastry cook in the pan. The last time I attempted it though, I had got a little bit cocky and had a complete disaster. You can imagine the stick I have got ever since over my flat eclairs! No such disaster today – shows that it pays to follow the rules! I completely let my pastry cool before I beat in the eggs in the kitchen aid. Add the butter, water and salt to pan and heat until it just starts to boil. Immediately remove from the heat and add the flour all in one go. Mix like mad with a wooden spatula or spoon until it comes together in one ball. Add back to the heat for 1 more minute. Take out of the pan and leave to cool completely. Mix in an electric mixer and add the eggs gradually. You should end up with not too sloppy a mixture. Put in a piping bag and pipe onto a lined baking tray. Pipe an equal amount of large balls and small balls at least 2 inches apart. Bake at 200C for 15 mins. Open the door then immediately shut it and then carrying on baking for 5-10mins at a reduced temp of 180C. Remove from the oven and allow to cool completely. Fill each ball with fresh whipped cream and stack a small ball on top of a large ball. Pipe little stars on cream around the join of the 2 balls and spread caramel sauce on top. 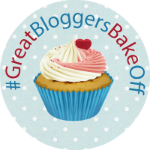 I’m joining in with Helen Jessop and Jenny Paulin as part of the Great Blogger’s Bake Off – Can’t wait for next week – Maybe I might even stretch to 2 bakes! I really believe that was the difference between last time and this – I left it for yonks. Another example of baking not being allowed to be rushed! that bun looks great…perfect for popping in my mouth!